Have I ever told you how much I adore Joan from Mad Men? I think she's a classy lady, for the most part, and I love her style (who doesn't?). I have a Pinterest board dedicated to her and my husband was kind enough to get me her signature pen necklace, so I can pretend to be more like her than I actually am. Stalker? An upcoming Sew Weekly challenge is going to be a Mad Men theme. 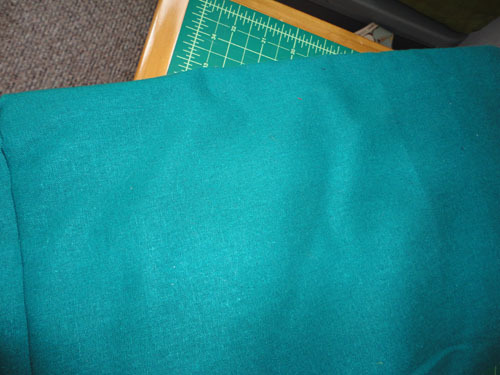 I was very excited because I had bought some fabric that screamed "Joan" to me before knowing about the challenge... but I keep looking at it and second guessing myself. Do you think this is a "Joan" color? I need your opinions! If you guys approve of this fabric then I am going to use it for a dress. Which dress? I don't know :( I need to figure out which pattern to use and find some time to get this done! I picture myself wearing my Mad Men dress, drinking Old Fashioned cocktails, and watching the new episodes. Man Men party? Yes, it's definitely a Joan colour!! Go for it!! I agree definitely Joan! I'm so excited about this challenge too, I've already got a dress in mind - now just need the fabric! Good Luck! DEFINITELY JOAN! I love her too! Cool that you got the necklace! Joan is one of my personal style icons as well. As she wears a lot of rich jewel-tone kinda colors, I say yes! yes! yes! to this fabric. Oh yes, Joan for sure. Can't wait to see the end result! That's Joanie all the way! Get stitching!!! As a curvy gal, I can't help but love her. Thing is, I'd better start on my Mad Men challenge stat, otherwise it will never get done in time.